Over the past few years, the publication division of The British Library has been doing a great job in reissuing forgotten gems as part of their Crime Classics series. 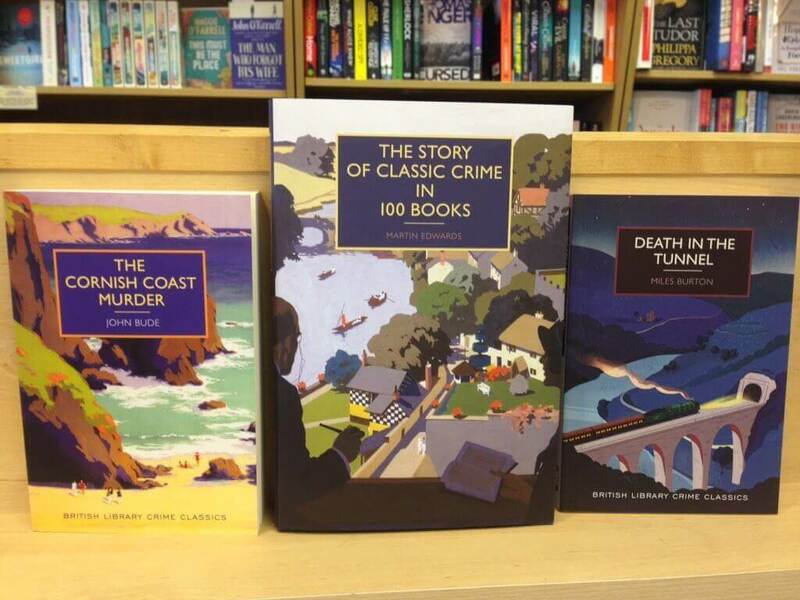 These are gentle and enjoyable mysteries, typically from the 1930s and ‘40s, the Golden Age of British crime fiction. With their vintage covers and retro styling, these books are a real delight. I thought I would share a couple of my recommendations with you, books I’ve read recently that you might want to try for yourselves. The opportunity comes when Julius Tregarthan, a rather secretive and mean-minded magistrate, is found dead at the house he shares with his niece, Ruth. When Inspector Bigswell from the local police force arrives on the scene, he is rather puzzled by the absence of any discernible clues. Luckily for the Inspector, Reverend Dodd is on hand, ready to put all the knowledge he has gained from those detective stories to good use. All in all, this is a delightful mystery, one that draws on its Cornish coastal setting to good effect. It’s been doing well at the Gerrards Cross shop recently, as has another of John Bude’s novels, the wonderfully titled Death on the Riviera. Who can resist a mystery involving a train journey? I certainly can’t! This one certainly fits the bill as it features a highly suspicious incident that takes place on the 5pm train from London’s Cannon Street to Stourford one night in winter. On a dark November evening, Sir Wilfred Saxonby is travelling alone in a locked compartment of the train. During the journey, the driver sees a red light, so he applies the brakes and slows down the train in the middle of Blackwell Tunnel. By the time the train emerges again minutes later, Sir Wilfred has been shot dead; and the murder weapon – a gun engraved with his initials – is lying on the compartment floor. At first, Sir Wilfred’s death appears to be a cut-and-dried case of suicide. Nevertheless, it is always best to be thorough in these matters, and Inspector Arnold of Scotland Yard is called in to take charge of enquiries. In this capacity, he is ably assisted by his close friend, the amateur sleuth, Desmond Merrion. The two detectives work very well together as a team, particularly as their skills are highly complementary. While Arnold tries to focus on the evidence and known facts, Merrion uses his well-honed powers of imagination and lateral thinking to develop possible scenarios as to what might have happened on the day – murder included. This is a mystery where the focus is on ‘who’ and ‘how as opposed to ‘why’. In this respect, it is a very effective puzzle, packed full of clues and a sprinkling of red herrings along the way. Finally, for fans of vintage mysteries, we also have The Story of Classic Crime in 100 Books, a compendium of the best crime fiction published in the first half of the twentieth century. With entries covering novels by Agatha Christie, Dorothy L. Sayers and many more, this would make the ideal gift for the mystery lover in your life. I’m hoping someone will buy me a copy for Christmas!